God Help The Girl has a relatively long history, starting with Belle and Sebastian’s Stuart Murdoch first writing a song in 2003. Straight away he knew this wasn’t a Belle and Sebastian song, and felt it was destined for another project. He wrote more songs and slowly the three main characters Eve, James and Cassie emerged from his writing. After Belle and Sebastian stopped touring their “The Life Pursuit” album in 2006, Murdoch began writing the screenplay, named after that first song her wrote in 2003. Murdoch then put a large open call for singers to join his girl band, God Help The Girl and this caught the attention of Producer Barry Mendel (Bridesmaids, Serenity, Rushmore). After recording the songs, which Murdoch felt was essential in his path to write the screenplay and a Kickstarter campaign later, here we are with the film being released in 2014, eleven years after the first song was written. 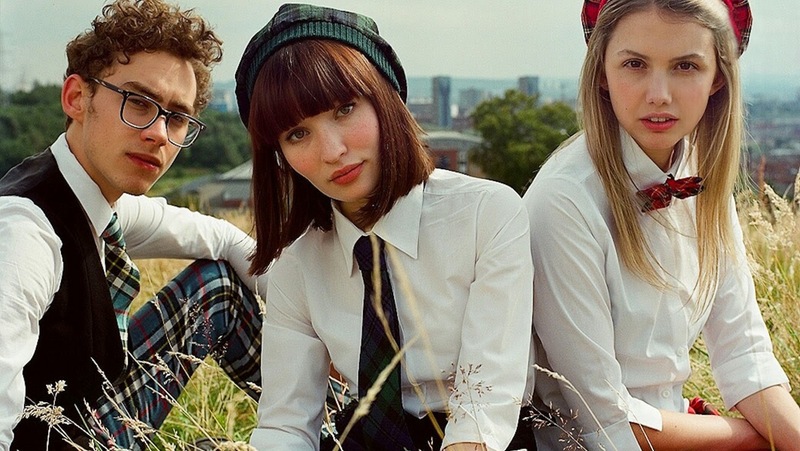 The film tells the story of Eve (Emily Browning), James (Olly Alexander) and Cassie (Hannah Murray) in their journey to forming a band and playing their first gig. This is a musical in the traditional sense, with big dance numbers including 50’s clad dancers, very much shows off Glasgow and it’s healthy indie scene. What makes this film interesting is that the big musical pop songs are interspersed with scenes of utter sadness showing Eve struggling with her anorexia and depression. The silliness, largeness and dare I say cheesiness of the songs help gives the film a manic depression quality which fully captures Eve’s state of being throughout the film. Eve is a complicated heroine, early on you learn that she’s left her native Australia in pursuit of a boy in a band, ending up in Glasgow. She struggles with anorexia and depression throughout the film, the only happiness being from music and writing songs. Emily Browning looks stunning throughout the movie, when the camera is on her, she’s all that you can look at. They reportedly looked high and low for someone to take on the Eve role and it’s understandable that she won the part, her voice suits the songs well and she has the acting breadth for the role and she wears the staple indie-girl bob so well. James is the music nerd of the group, analyzing and opinionated, he gives the level headed and sometimes cynical approach. He is understandably in love with Eve, though misses his opportunity. As they point out in the film, no men stand a chance when there are Swiss/Germans around! He is almost too aware of the musician clichés, very much aware on what path they could follow and resistant to this. The very idea that they could be a band, and could record an album is a revelation to him. He doesn’t see himself as someone in the limelight, just someone playing competently in the background. The James and Eve relationship, as in every good Belle and Sebastian song is a complicated one. Eve is completely lost and in no state for James to even approach. Then when James finally addresses it, Eve tells him he’s too late. It’s hard really to tell who is right, but regardless Eve has made her mind up. When the girls try to broach the subject of what their band should be called, James cuts them off saying there are 1000s of people having this conversation on a Saturday afternoon, that they should not be part of that. Obviously this attitude is not going to lead to success, and could be one of the reasons why Eve chooses to leave him in the end. Even through her illness she knows that she is talented, and maybe James’ contrariness and cynicism of pop tropes, of doing what everyone else does, though well meaning will hold her back. Cassie is played by Hannah Murray who you’ll most likely recognize from her part as another Cassie in teen drama Skins. Murray was originally considered as the role of Eve, though understandably she is much more suited to Cassie, the younger addition to the band. She does a great job as back up to Browning, her voice is not as strong as Browning, but her undeniable bubbliness adds some lightness to the dark. The indie train-spotter will be pleased by the number of Glasgow indie band cameos the film is littered with, Camera Obscura’s Lee Thompson show’s James how to fight like a true Scotsman early on in the movie, twins Bjorn and Eric from Wake The President run around through a number of the musical numbers with LOVE and HATE sweaters and of course the majority of Murdoch’s Belle and Sebastian colleagues make an appears throughout the movie in various guises. There’s probably countless more that I didn’t spot, so please let me know if I missed any! Every indie kid’s favourite comedian Josie Long has a far too brief cameo as one of Eve’s hospital football team and Mark Radcliffe and Stuart Maconie play DJs Findlay and Donovan, whose DJ patter introduces the movie and continues throughout the film. This reminded me of my teenage years in the late 90’s, listening to their late night show on Radio One when, as they do in the film, were probably making jokes about Stephen Pastel’s hair cut. Cora Bisset is fantastic as Eve’s doctor Mrs. B, you may recognize her from the smash hit play Midsummer (if you like this movie, I highly recommended you seek it out) the scenes she has are far too short. This film is the imagination of Stuart Murdoch and has the hallmark of his precious, romantic, beautiful and poignant vision of the world, which he has sculptured in his songs. Aspects of Murdoch aesthetic are sometimes annoying and jarring and at times I was a bit unsure whether I liked the film. However when it’s right it’s right and it’s overall it’s a surprisingly beautiful, sad and well thought out film. God Help The Girl will probably be mainly watched by fans of Belle and Sebastian, but I don’t think the audience should be limited to just this group. If you want to see a film that has the potential to make you laugh, cry, think and sing then give it a go, and it probably helps if you enjoy a good old fashioned song and dance in a bookshop.